1. Buy plants appropriate for your area. Even if you live in rainy areas, your best bet is to look for water-wise plants that will save you the time and expense of watering. 2. Check your winter temps. Most perennials can make it thru winters, but some are too delicate and may have to be brought inside for overwintering. 3. Check your soil mixture. Some soil is heavy with clay which plants have a hard time thriving in. 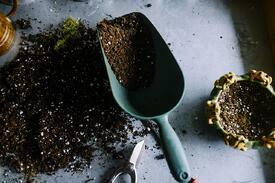 Break it up by adding compost (you do have a compost pile, right?) or add layers of garden soil from a garden center. 4. Think about using a mix of perennials and annuals. Perennials come back every year, but may take a year or two to fully flourish. Annuals will last just one season, but bloom fairly quickly. 5. Check your plant choices to be sure they are not harmful to horses. 6. Don’t forget to leave a “burn free” zone around structures in case there is a fire in your area. Use noncombustible mulch like gravel. 7. Not all plants have to go in the ground. Use old wine barrels or even muck buckets for planters. 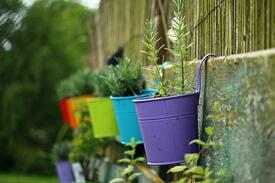 Get creative and use old rubber boots or used supplement containers as flower pots. 8. And not all plants have to be flowers. In addition to shrubs, consider creating a raised bed garden to grow carrots or other horse friendly treats. According to Kentucky Equine Research, you can safely feed your horse small pieces grapes, strawberries, cantaloupe or other melons, celery, pumpkin or snow peas. 9. If your landscaping includes trees, don’t plant them too close to structures. Roots can extend under floors and even crack concrete. Plus, in case of a windstorm, you don’t want branches or even the whole tree crashing on your building. 10. If you plan on adding some landscaping or a garden this year, make sure that you’re willing to commit to the upkeep - watering, fertilizing, weeding. Of course, if your barn caters to children, you may find some willing gardeners to help you without even asking!